This is not a guide to every cloth diapering option ever because, well, too many options. I’m not a huge cloth diaper fan or particularly passionate about it. We only do it to save money. Side bonus – there are no emergency trips to get diapers. We’ve definitely had to do that before. We started when Addie was 9 months. We had just moved to Boston. I’d been debating it since she was born really, but since we had an income, spent a summer living with my inlaws, then moved across the country, I never got into it. Then we stopped having an income and Ben went to grad school and we lived on loans, so I took the plunge. We initially spent $100 on a couple days worth of cloth diapers, and bought a $30 box of cloth-diaper-safe detergent that ended up lasting us over a year. When I was 36 weeks pregnant with Emma, we moved to Omaha with a 16 month old, and lived at my in-laws’… and stopped cloth diapering. Obviously. Then we had 2 in diapers for so many months and it just seemed daunting to keep everyone’s butts clean, let clean them in cloth. We were living out of boxes for longer than I’d care to admit. Our one tiny bathroom felt crammed, I didn’t have a good system, and basically, we were in survival mode. Finally, as our 2 year old neared potty training, and we started to come out of our 2-under-2 daze, I bought a few more on craigslist and figured out a cloth diaper system that worked. So back in cloth we went. By “we,” I mean Emma, the second kid. 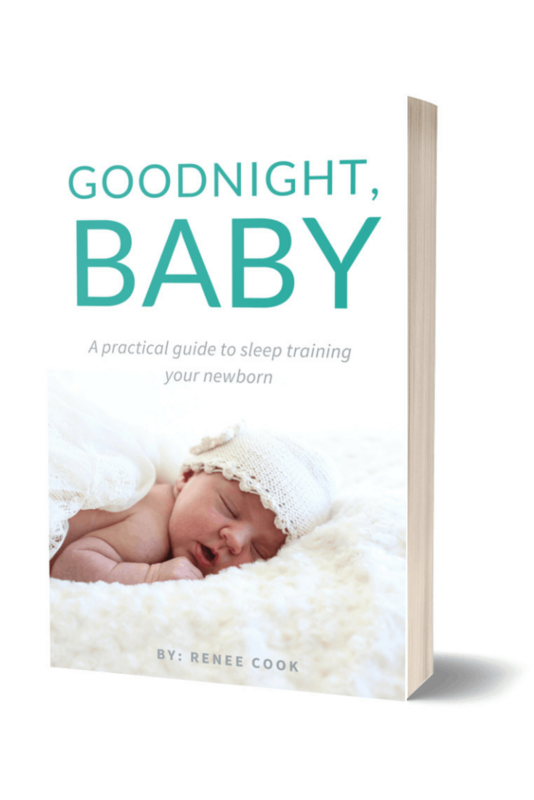 WHAT ARE MY CLOTH DIAPER OPTIONS AND HOW DO I CHOOSE? If you were in my living room asking how to choose cloth diapers, here’s what I’d tell you. It seems like there are a billion options in cloth diaper world, but really there are 2 choices you have to make in order to purchase cloth diapers. Sized diapers are less bulky and you buy them in sizes – small, medium, large. Kind of like buying disposables in sizes. The pros are being less bulky, and lasting longer because you only use them for part of your cloth diapering with each kid. Also, some people say they fit better. The obvious con is you have to buy more diapers. I don’t personally use these or have any friends who use these, so I don’t know much about them… all my cloth diapering friends are on a tight budget and primarily cloth diaper to save money. 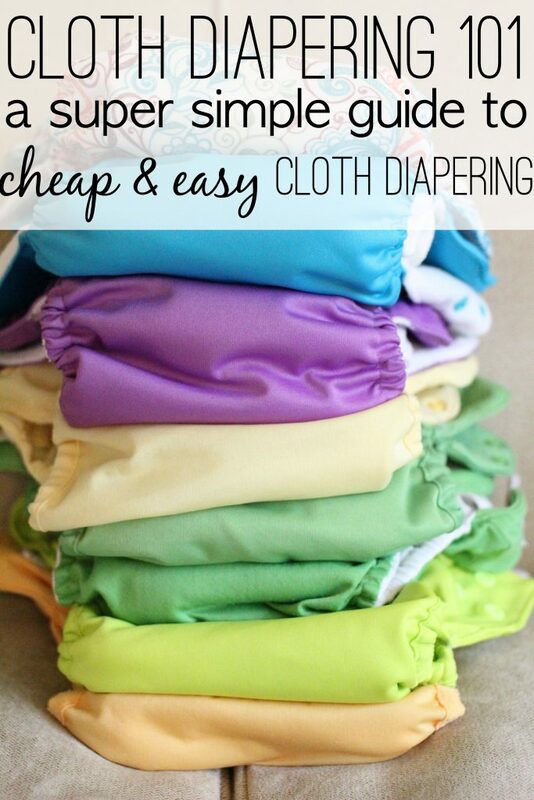 If you are cloth diapering to save money, do not buy sized diapers. Unless you plan to have 4+ kids. Then it might still save you money. One-Size Diapers have all kinds of snaps or velcro that allow you to adjust the diapers across the tummy and up-and-down. (see picture below.) Depending on the brand, they claim to fit babies 8-35 lbs ish. The main pros are, one-size diapers are cheaper, and you don’t have to buy several different sizes. Cons: They’re bulkier. They could wear out and need replacing if you want to use them for 2-3 years each on a bunch of kids. *Note: we’ve never cloth-diapered a newborn, so I don’t know how the one-size diapers fit newborns. I’m guessing you’d wait till baby is 12+ pounds for any of these even though they say 8 lbs. BUT, exclusively breast-fed babies’ poop is 100% water-soluable so if you do cloth diaper a newborn, you can throw it right in the washing machine… no rinsing needed. Weird! Also, there are newborn size cloth diapers available. But again, we just use disposables for those first few months. There are a ton of different brands, styles, and types of cloth diapers. All-in-ones are exactly that. All in ones. They go on like disposables – in one piece. No inserts no clips, no pockets, no covers. 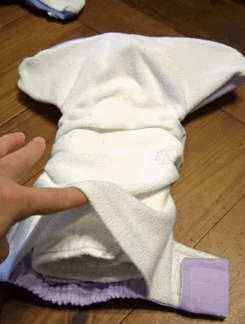 The inside of the diaper is absorbent fabric that wicks away moisture and the outside is water proof. They’re cloth versions of disposable diapers. The ones we have are seriously amazing. They really don’t feel that wet after baby pees, similar to a wet disposable. Also similar to a disposable, they hold a lot of pee! 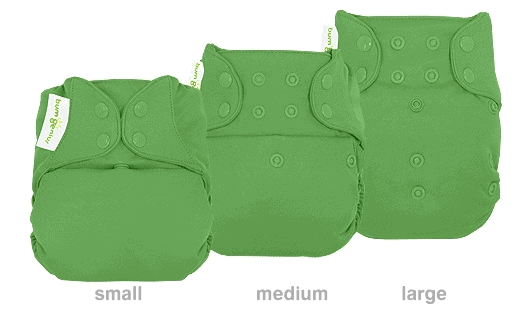 Pocket diapers are a two-piece diaper that has a cover + a thick absorbent piece that fits into a pocket. You can sometimes mix brands of covers with different brands of inserts which is why it gets confusing to read about people’s suggestions and favorites for pocket diapers. 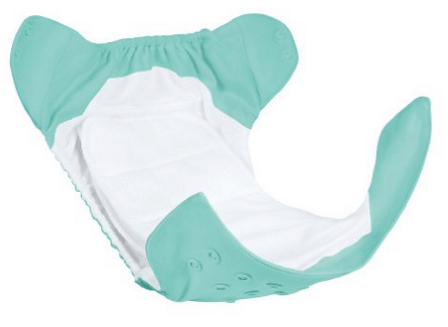 All-in-two diapers are 2 pieces: a diaper cover + piece of absorbent cloth. Similar to pocket diapers but no pockets. Here is a picture of a few different brands of all-in-two diapers. Do I want to buy one-size or several sizes? Do I want all-in-ones (AIOs), pockets, or all-in-twos (AI2)? 6 Flip Diaper Covers + 18 Size 2 OsoCozy Prefolds* (which would last you a couple days before washing) = $150. 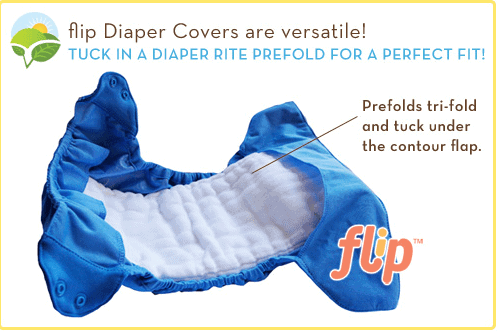 A cover + a prefold is absolutely the cheapest way to cloth diaper. Prefolds are like those old fashioned cloth diapers you picture people using 30 years ago. Instead of folding and pinning them, you can just lay them in a waterproof cover and snap it on like you would a disposable diaper. You don’t need to wash the cover if the cloth diaper gets wet. You can just wipe it down and reuse, which is why only 6 covers would last a couple days in between washing. Always wash the cover if it’s poopy… duh. Personally, I love the ease and slim fit of flip inserts, but they’re more money than the prefolds. I recently bought a giant pile off a lady from craigslist, and love using them exclusively. They come in packs of 3, for $15, so $5 each as compared to $2-3 each for prefolds. At first, I recommended a cheaper all-in-one (AIO) made by Diaper Rite. But those have worn down pretty quickly. BumGenius Freetimes are my favorite budget-friendly option on the market. They’re $19.95 each, and often you can find package options, like 6 for $106*. If I was doing it over again from the beginning, knowing I’d cloth diaper at least 3 little bums for about 2 years each, I’d by 20 of these and call it a day. You can buy bumGenius diapers lots of places. Amazon is my go to. * Diaper Junction has packages of 6, 12, 18, or 24* that drop the price per diaper down to about $18 (instead of 19.95 if you were to buy them individually). 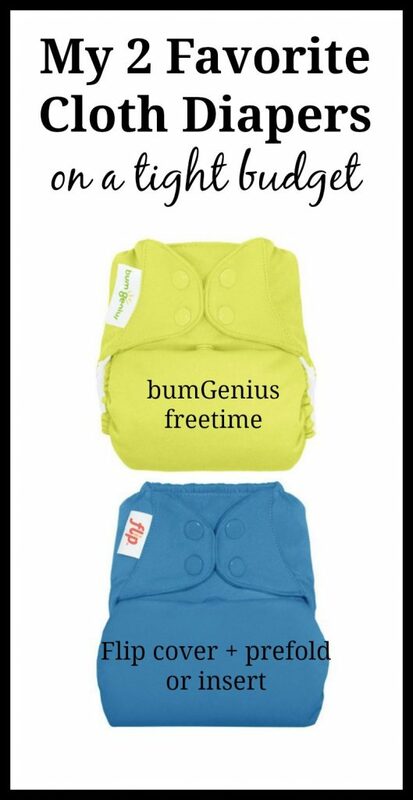 Cotton Babies & Kelly’s Closet also sell similarly discounted packages of bumGenius Freetime diapers. If you’re not sure about cloth diapering, Kelly’s Closet also has a risk-free 30 day trial option for select brands of diapers, including BumGenius Freetimes. You can try them out for a month and return them for all your money back if you don’t like them. Read more about it here! BUT HOW DO I DEAL WITH ALL THE POOP? No doubt about it, there is a lot of poop with cloth diapering. But there’s a lot of poop with diapering in general. And contrary to what I thought initially, it’s not that much grosser in cloth. (Except sometimes, it is. Like when you get stuck with a blowout in public and no backup supplies. Woops.) Here are the deets on how we partially cloth diaper & my no-touching-poop method of dealing with the diapers. Our primary goal is the combo of cheap and easy, which means we put our kids in disposables too. We never ask other people to use cloth diapers (babysitters, church nursery, grandparents, etc…) For a long time, even Ben didn’t really use them. If he changed them, he’d put on disposable I didn’t really care, but he’s come around. Especially with the ones that are all one piece because they go on just like a disposable. I do almost always have Emma in cloth at home or when we run errands around town. Both girls wear a disposable overnight. We do milk before bed and they’re generally heavy wetters. I didn’t care to add all these special doublers or super absorbent extras to our cloth diaper collection. Plus they both often poop first thing in the morning, so disposable is just easier. 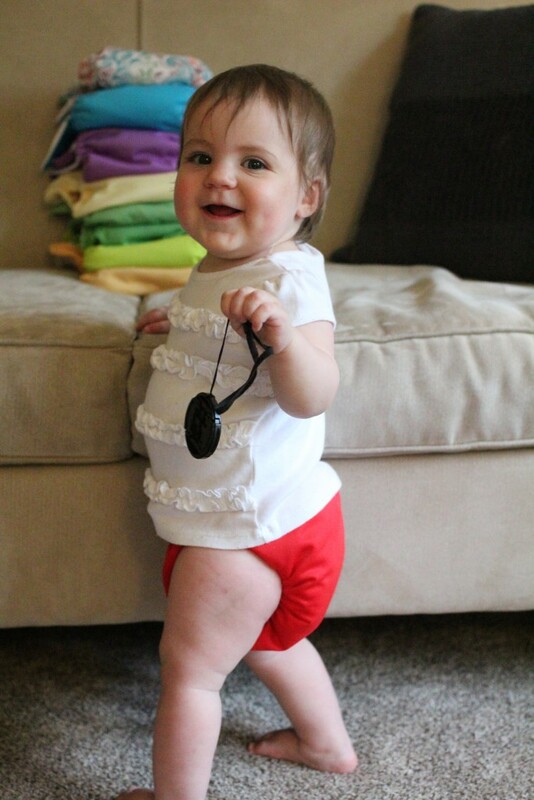 Our $15/ month budget covers wipes, Huggies or Target brand disposable diapers (my 2 faves). I only buy diapers on sale and usually stack coupons. It’s one of the only things I coupon for. I now use Tide Original Powder detergent on all our clothes and diapers (separately washed). Keeps it simple. Have never had a problem with the diapers smelling or leaking. It has to be original powder, so I hear. I’ve never tried other Tide on cloth diapers. The first brand I used was Country Save. It lasted forever, but I like Tide better. I keep a plastic bucket and rubber gloves in the cabinet under the bathroom sink. If the diaper is poopy, I rinse whatever I can in the toilet, and run the bath water on full water pressure over a bucket to rinse off the rest. I dump that water in the toilet too. Then I let the diaper soak in the bucket in hot water with a tiny bit of this bac-out solution* (helps with stains + smell). Later, I rinse it out and add it to the wet bag. I probably get around to washing them every 4-5 days. Some people prefer to wash every other. I used to throw everything in the dryer, but recently I’ve started hang drying them to make them last longer. All our diapers are in great shape still after using them 7 months with one kid and another 12 so far with a second. BUT DOES IT REALLY SAVE THAT MUCH MONEY? 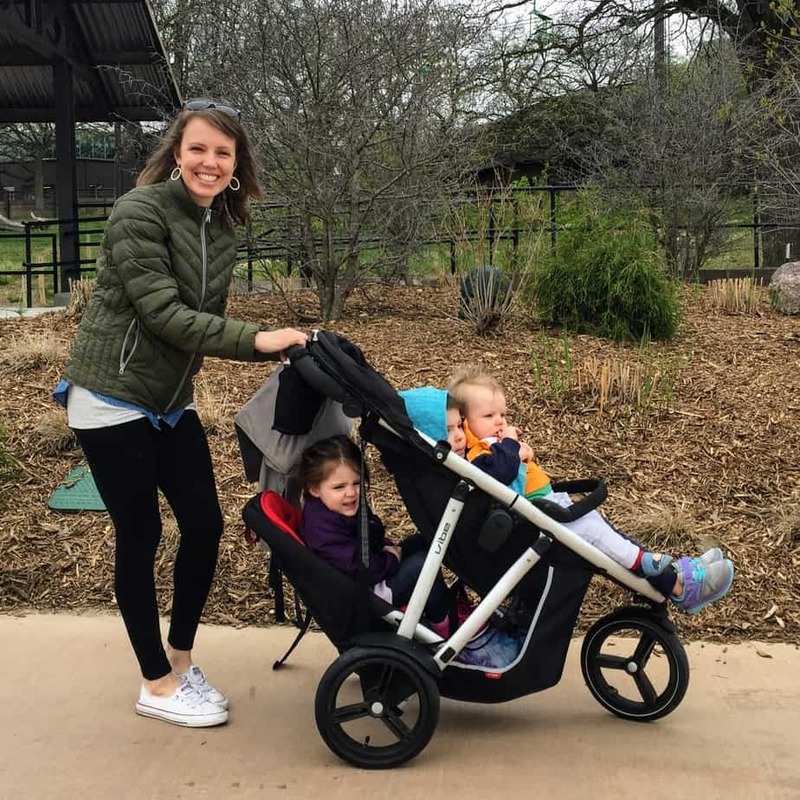 When I had two kids in disposables, our monthly diaper budget (with me crazy-couponing them and never spending more than a unit price of 14-17 cents per diaper) was $60/ month. Minimum. Now it’s $10-15. And that includes wipes + disposables for nighttime/ babysitters/travel + cloth diaper cleaning solution. So it’s only around $600/ year in savings… ish. But with multiple kids over many years it adds up. Our main reason for doing it is to pinch pennies while getting out of debt. And if we’ve learned anything about getting out of debt it, it’s every $50 matters. equals hundreds of dollars a month = getting out of debt sooner = being free to do other things with money besides give it to Sallie Mae. So, are you considering taking the plunge? Or do you already cloth diaper? If you do, share the products you love in the comments below… anyone who’s made it this far is definitely interested in hearing your opinions and recommendations! What is your laundry soap? I’ve read about people who use expensive stuff and have 15 thousand steps to washing their’s. I need a simple, cheap routine that works! For us, the point of doing cloth is saving money. Haha I totally know what you mean. The cloth diaper world is crazy!! Glad this was helpful & good luck. CJ, you’re a cloth diaper pro! Thanks for the tips. Isn’t it fun to see how much you saved over the years! If you put that $2700 in a mutual fund that grew at an average of 10%, you’d have $11,000 in 15 years 🙂 haha!! Good post. 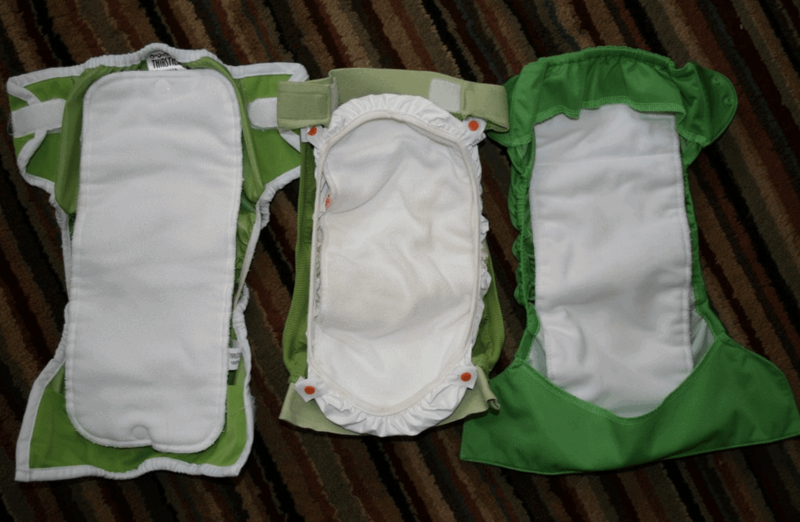 We had 4 babies in 8 years, and cloth diapering saved both my sanity and my pocketbook. We’ve continuously had at least one, and sometimes 2, in diapers since having our oldest in 2006. For cheapness, prefolds are the way to go, but for simplicity of use bumGenius is … well, genius. They often go on sale for buy 5 get 6. Some of mine I’ve been using since 2007 when we originally made the switch to cloth with our oldest (she was about 18 months when we started! ), but they’re at the bottom of my stash desperate-for-a-diaper-on-wash-day. My current favs are Peachy Baby and AMP (both are made by the same company in Canada), which my SIL lent me from her stash when my very-worn bumGeniuses were not fitting my very chubby #4 very well anymore. I bought more of those and gave them back to her for her new baby, and we’re going strong on the ones she gave me. For overnights, I’m using my newer bumGenius covers (I bought a handful more with #3) with an AMP tri-ply bamboo insert folded in 1/2. In terms of cost, I’m in Canada and do spend the money on the special soaps as I have quite hard water where I live. In 8-9 years, I think I’m on bottle #4 of it (I use Allens for $20 a bottle). I costed out the prices for disposable diapers years ago vs. cloth. We generally can’t stack coupons here in Canada. To diaper one child in generic diapers bought on sale, with generic wipes, I couldn’t do it for less than $12 a week. I typically wash diapers 2.5 times per week (some weeks is twice, some weeks is thrice), which costs me about $1.50 in water, energy and soap, not including wear-and-tear on my machines. So, for disposables I couldn’t do it for less than $624 a year, whereas cloth costs me about $195 for washing and drying. If I amortize the cost of my diapers, I’m guessing that I’ve spent about $1000 on diapers (I’m guessing high) since 2007 (it’s now 2016 as I write this), so an average of $111 per year purchasing/replacing diapers. When I’ve bought diapers, I’ve always bought new vs. used although I try to buy seconds when I can. So it’s about 1/2 the cost for me to diaper with cloth vs. disposables (round to $300) x 9 years = $2700 I’ve saved over 4 kids.